Commander Kevin Modica may be new to TriMet’s Transit Police Division (TPD), but he’s not new to the concept of community policing behind the division, what he describes as a “fantastic” model. Commander Modica is excited to lead the division and the officers he says provide “great service” for TriMet. Modica, age 55, was promoted to Commander in June and assigned to TPD. 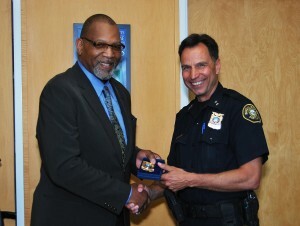 He replaces Mike Crebs who was promoted to Assistant Chief at the Portland Police Bureau (PPB). Commander Modica has served in law enforcement for 31 years, the past 27 with the PPB. “Most of my time in law enforcement I’ve worked closely with the community,” Commander Modica told the TriMet Board of Directors on Wednesday, July 24, 2013 during his formal introduction to TriMet. TriMet’s Transit Police Division is a unique, collaborative model. While technically a division of the Portland Police Bureau, it is made up of officers from 17 local police agencies. Each of the agencies has a specific number of officers they assign to TPD. Currently, officers serve three or four year terms, except for those who work on our canine teams. Those officers serve seven years. During their assignments, the officers work full time on TPD. Before his assignment with TPD, Commander Modica worked in the Family Services Division and Portland Office of Emergency Management. He served as the architect in rebuilding of PPB’s Youth Services Division. Modica also previously worked on the Gang Enforcement Team as an Officer and a supervisor, as well as in the Gang Resistance Education and Training Program (GREAT), among others. Commander Modica has received many awards including the Dennis Darden Officer of the Year Awards, two Distinguished Service Medals, and the MLK Lifetime Achievement Award. He is a member in good standing in the National Organization of Black Law Enforcement Executives (NOBLE) and serves on the National Policy Board for GREAT, is a Fellow candidate at the Georgetown University Juvenile Crime Prevention Institute and is a former instructor at the Oregon Department of Safety Standards and Training (DPSST). Commander Modica attended the JFK School of Government for Crisis Management and the Hatfield School of Government at Portland State University. He has three daughters: Lauren, 30, is an actress in Portland; Rachel, 27, is a teacher in New York; and, Naomi, 23, who recently graduated from the University of Oregon. All, the Commander says proudly, use transit.